Audio Description at Museums, Parks, Exhibits, and More! Audio description at a museum, park, or exhibit is not the same as an audio tour or a docent-lead tour. Audio description has a different focus: describing the actual object, rather than addressing its creator or history, for example. A true audio description tour of a museum would actually assist in leading you from exhibit to exhibit, and the emphasis would be on size, shape, color, texture, detail. If you are lucky, you will be allowed to touch some of the objects on display, but you should not expect this accommodation. For an example of museum description, see our page on Audio Description of a Museum Painting. See also the Verbal Description Database by Art Beyond Sight's Museum Education Institute. You can also play the video on the following page to hear a visually impaired art museum tour guide explain How Do Visually Impaired People Enjoy Art?. 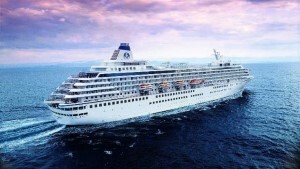 Some cruise lines also offer audio description accommodations. We have a "white paper" on the subject: Cruising to a More Inclusive Experience on Cruise Ships. National Parks are expanding their use of audio description. Read: The UniDescription Project: Seeking to Bring Unity to the World of Audio Description and one user's experience with the Yosemite beta test and Audio description app studied by field-research team at Muir Woods National Monument. Search for "unidescription" in your phone's App store to hear audio description of more than 50 National Park Service brochures so far. You can also listen to Eyes on Success Podcast 1839 which addresses Accessibility of US National Parks. Not many museums or parks offer audio described tours. Here are the ones we know about. Unless mentioned, there is no assurance these tours are any different from regular audio tours, but they have been reported by patrons who are blind. Let us know about ones in your area so we can list them! NOTE: We have been asked about tactile displays for museums to supplement audio description. One source we know about is the Lighthouse MAD Lab. UPDATED December 2018 -- Thank You Contributors! Birmingham Museum of Art tour - special tactile tour designed for individuals with visual impairments. Contact: 205-254-2964. McWane Science Center, Birmingham. Check out the $4 Tuesday IMAX special, some of which are audio described. 205-714-8300. US Space and Rocket Center IMAX Theater, Huntsville, 256 837-3400, ext. 878.
of American Art, Bentonville, AR. The Crystal Bridges Museum of American Art in Bentonville, AR, offers special "verbal description audio tours" downloadable as an App or borrowed on devices within the museum. Free tactile and multisensory tours of the museum are offered upon request with advanced notice based on availability using this Crystal Bridges Contact Form. Read the multisensory tour blog post. Disneyland and Disney’s California Adventure (as well as Disney World in Florida - see Florida) offer an audio description "Handheld Device" (that's the official name) for select attractions and shows. A $25 refundable deposit is required to borrow the equipment from Guest Relations. Read the official Disneyland Services for Guests with Visual Disabilities page. 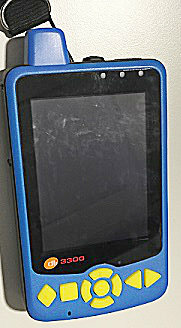 The same device is available in Florida at Disney World. See additional article references under Florida and be sure to read the Webmaster Comments there. NOTE: The devices was updated in 2018, and its new photo is below. The Getty Center - Los Angeles; GettyGuide multimedia players are free of charge at the pickup desk and contain a "visual descriptions audio tour." The Getty Villa - Pacific Palisades; The GettyGuide multimedia player is free in the Atrium but does not have a specific audio description tour; a 20th-century replica of Venus is available to touch at the end of the Outer Peristyle, and explanatory labels are provided in braille; "Handling Sessions" are available when planned with the museum in advance. Yosemite National Park offers an audio described tour of the visitor center museum, and their park film, Spirit of Yosemite, is also audio described. Marin Headlands- There are some exhibits that are tactile and there are some exhibits that provide audio recordings for visitors with vision impairments in the Visitor Center. A three-mile moderate walking tour with 18 stops that will take about 3 hours to complete. A 3/4-mile accessible tour route around the Fort Baker parade ground with 10 stops that will take about 1 hour to complete, plus five additional stops that can be listened to from your car. When you get to Fort Baker, follow the guide and look for the small signs indicating a stop. Then call 415-375-8281 and enter the tour stop number and then # (pound sign) to hear 1 to 2 minute audio segments. The tour is free, but your cell phone carrier will charge their usual rate for minutes used in the 415 area code. You may also call into the tour from home or any location and visit the stops in any order. If you want to listen to the tours on your personal mp3 player, you can download the mp3 audio files as well as .pdf and .doc text versions of the audio files. Nike Missile Site- audio described video about the site. Crissy Field- You can download audio described recordings of "Under Three Flags", a brochure documenting the history of the Presidio of San Francisco; "The Natural Presidio", a brochure about plants, animals, and the natural environment; or "Golden Gate NRA", the general park wide brochure. Alcatraz- Audio Described Tour, Braille Transcript of Cell House Tour. Lands End- Audio Described Tour at the New Visitor's Center is available for check out at the service desk can be downloaded as a digital file of the recording. Audio Tour and Self-Guided Tours Descriptive audio tours specific to the park and a printed self-guided tour of the park and nearby Fisherman's Wharf are planned (posted Oct 2015). The Los Angeles County Museum of Art. Their website says, "Tours [for visitors with special needs] must be arranged at least three weeks in advance and depend on availability of LACMA's trained art docents. Please call 323-857-6109 or email educate@lacma.org for more information." The International Spy Museum offers an audio described tour. The John F. Kennedy Center for the Performing Arts (aka The Kennedy Center) will provide audio description for most of its performances if requested at least three weeks in advance. The Library of Congress is now offering a touch tour twice a month. Press Release. News article. The National Gallery of Art: Audio tours providing vivid descriptions of works of art are conducted by Picture This on the fourth Wednesdays and Saturdays of each month starting at 1:00 PM in the rotunda of the gallery's West Building. The tours last about an hour. National Portrait Gallery: 202.633.8506. Portrait Insight Tours every month: verbal descriptions and tactile objects. For more information: Access Programs Page. To get on the list to receive monthly emails about these tours, email your request to: NPGAccess@si.edu. The United States Holocaust Memorial Museum will provide a special guided tour for blind and visually impaired visitors upon request. You can download the Audio Tour of the Museum’s Hall of Witness and Hall of Remembrance in advance for you own device, or ask to borrow one at the museum. The George Washington Memorial Parkway has wayside signs with tactile elements and some audio components. If you wish to experience a tour with audio components, contact the park ahead of time. The White House offers an audio tour, which features welcoming remarks from Mrs. Obama followed by a room-by-room audio description of the highlights and features of the White House. The audio tour must be requested at the time the tour reservation is made through a member of Congress, at least 21 days in advance. Read the Press Release! Walt Disney World (Magic Kingdom, EPCOT, Hollywood Studios, and Animal Kingdom) is offering an audio description "Handheld Device" (that's the official name) for select attractions and shows. (See photo above under California). A $25 refundable deposit is required to borrow the equipment from Guest Relations, and you must borrow the device separately at each park from the Guest Relations office just inside the entrance gate on the left (except for EPCOT, where it is located beyond Spaceship Earth, and there is no Guest Relations office at the rear entrance to EPCOT). Read the original Disney announcement, or read the WGBH Media Access announcement, or view and hear a video of the Haunted Mansion overlaid with the audio from the Handheld Device, or read and view more information about the device and its technology. And here is the official Disney World Services for Guests with Visual Disabilities page. Webmaster Comments From 2014 (prior to using the current device): Be sure you set your expectations for this device with the Guest Relations staff! If you have a sighted person with you, make sure you get a copy of the handout describing the device and listing which attractions feature description. Also make sure you understand WHEN you have to push a button to get description and when it is supposed to occur automatically. We have no experience with the NEW device introduced in 2018. The Arizona Memorial offers sighted guide assistance and includes a special unit that can be borrowed to assisted blind users enjoy the tour. The USS Bowfin Submarine Museum offers audio self tours (no hands on), but they are not safe for a blind person alone. Audio Description Illinois, Alliance Library System, provides audio description of digital images for libraries in their system. The Art Institute of Chicago offers MP3 audio guides, tours with sighted guides, TacTiles kits, touch gallery. The Museum of Science and Industry in Chicago can send a person to accompany a patron who is visually impaired; please call in advance to arrange. The Indiana State Museum in the White River State Park in downtown Indianapolis has an app which helps visitors with visual impairment around the museum. Read the App Announcement. Spencer Museum of Art, University of Kansas, Lawrence. They offer "Art Beyond Sight" tours. The Dole Institute of Politics, Lawrence, has temporary exhibits that usually include audio description, and past ones may remain online with description. Tallgrass Prairie National Preserve offers an interesting device called a Trekker Breeze+ which uses GPS to determine where you are on 40 miles of trails. "Hear the sound made by the bison, bird calls, coyotes, and the voice of a park ranger telling about the natural and cultural resources that make up the preserve." Mass Audibon, with locatons across the state, has several accessibility features, including "Sensory-rich audio tours (available by cell phone and/or audio players)." Museum of Fine Arts, special audio description tour on the MFA Guide (free for blind visitors at the Sharf Visitor Center, but request the version with the tactile dot on the number 5); also available, "Behind the Screen" self-contained tour and sachel; Tactile Art Cards for all ages; audio tactile book "Style: Period Details Explored in Teapots"; and Feeling For Form tactile tour (please email the MFA museum for this tour). The Henry Ford (multiple buildings) offer some limited accessibility services for visitors with vision impairment. See "Accessibility" on the referenced web page. See VSA Minnesota's Accessible Arts Calendar for updated information. Join the mailing list by writing access@vsamn.org. The Mob Museum, the National Museum of Organized Crime and Law Enforcement located in Las Vegas, offers described tours on request. The Albuquerque Museum of Art and History has had docents trained to give tours to patrons who are blind. In Buffalo, the Albright-Knox Art Gallery offers a multisensory tour the first Saturday and second Wednesday of each month. In New York City, most of the major museums offer monthly programs oriented to people who are blind. Art Education for the Blind's Art Beyond Sight is very influential and active in organizing these programs and working with other museums. 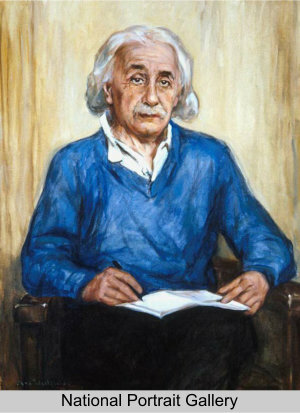 Contact individual museums for program information. Cooper Hewitt Smithsonian Design Museum offers a twice-weekly verbal description tour called Access+Ability, which can also be scheduled privately for small groups. Large Print labels and Braille are also available. Be sure also to visit their online Object of the Day blog, which features spoken description. Rubin Museum of Art (verbal description and touch tours second Tuesdays of each month). An accessible tour is available at the 9/11 Memorial Museum. It is available online for downloading or via a handheld device at the museum. Contact Emmanual at 646-583-3419 for details. Three weeks notice is requested for guided personal tours. Whitney Verbal Description and Touch Tours: As the preeminent institution devoted to the art of the United States, the Whitney Museum of American Art presents the full range of twentieth-century and contemporary American art, with a special focus on works by living artists. Explore the Whitney's permanent collection or special exhibitions with a highly skilled museum educator trained to provide vivid, detailed description of the works on display. Visitors are also able to experience a selection of works through touch. Whitney Verbal Description and Touch Tours provide an opportunity for visitors who are blind or have low vision to experience the richness and diversity of twentieth- and twenty-first-century American art. These ninety minute tours are free and are held monthly as well as by request with three weeks advance notice. To place a request, inquire about the next scheduled tour, or sign up for our email list, please contact Whitney at accessfeedback@whitney.org or (212) 570-7789. The Whitney Museum is located at 945 Madison Avenue at 75th Street. The Franklin D. Roosevelt Presidential Library and Museum in Hyde Park offers 13 hours of audio description in both English and Spanish via a handheld device. Other sites of interest would include the Statue of Liberty (which has audio tours) and the African Burial Ground, a National Monument, which has "an audio component for the sight and/or hearing impaired." Read about the DADA Project (Durham Audio Described Art, by Duke University students) -- a model for other universities! Some sculptures sponsored by the City of Raleigh Arts Commission have an audio description tour online: Greater Raleigh Sculptures. While the artwork has changed, the audio description of the Cary Outdoor Sculpture Exhibition is still online. The NC Museum of Art offers audio described touch tours by a specially trained docent. The tour includes touching certain exhibits with gloves. Arrange the tour in advance by calling 919-839-6262. Note: Audio Description was made available for the You Are Here exhibit from April 7 to July 22, 2018, and is available online. Read the Press Release or Listen to the Podcasts. The Contemporary Art Museum (known only as CAM) offers audio described tours upon request. The Visual Art Exchange (VAE) sometimes has tactile exhibits. Visit Arts Access for possible other opportunities. The Cleveland Museum of Art: Specially designed tours for visually impaired visitors are offered by prior arrangement. Contact edprograminfo@clevelandart.org. 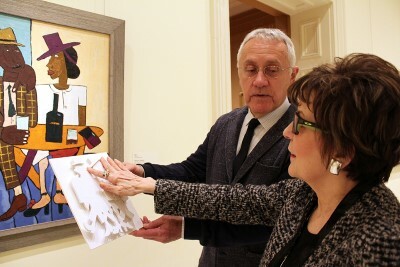 Groups that include individuals with vision impairments might also wish to inquire about scheduling an Art To Go session on site at the museum. Contact klevinsky@clevelandart.org to inquire. Art-to-Go programs allows visitors to handle and hear about actual works of art. Free for persons with visual impairment only; fee is $75 per group for others or $100 if program travels to you. Register two weeks in advance minimum for Art-to-Go at https://cmaweb10.clevelandart.org/cgi-bin/Education.py; not all dates may be available. Ohio Craft Museum: Several audio described touch tours offered for rotating exhibits. Contact Megan Moriarty by phone (614) 486-4402 or email mmoriarty@ohiocraft.org. Riffe Gallery (the Ohio Arts Council): Contact Kim Turner by phone 614-995-0066 or email kim.turner@oac.state.oh.us. The Franklin Institute in Philadelphia can provide a staff member to tour the exhibition with you to describe artifacts; call at least one week in advance to arrange. The Philadelphia Museum of Art offers multiple accommodations for people with visual impairments, from Braille signs to free audio tours; but they also offer personalized tours including tactile tours (plus tactile interpretations of paintings) when arranged in advance. Their "accessibility" page is quite extensive and a good model for others. The Warhol (The Andy Warhol Museum) in Pittsburgh has an audio guide called Out Loud that features visual descriptions of artworks. Here is a video that discusses the audio guide and how the audio guide was put together. At the time of this writing, the tour has not been finalized, but expect an audio described tour of the facility at Cowpens National Battlefield, a Revolutionary War battleground in Gaffney, SC, sometime in 2015. The Country Music Hall of Fame and The Hermitage in Nashville both offer hand-held audio devices. The Houston Livestock Show and Rodeo offers live audio description. 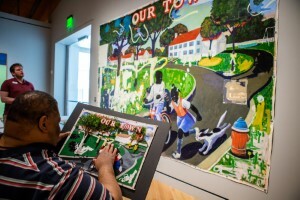 The Meadows Museum at Southern Methodist University offers multimodal programming with raised-line, tactile drawings; touch tours; descriptions of the art work; low vision optical aids; Braille and large print; and sighted guides and interpreters to accommodate the needs of visitors with disabilities. Contact Dr. Carmen Smith, mcarmens@mail.smu.edu, 214-768-4677. Museum of Fine Arts Houston. "Art Beyond Sight" - Trained gallery educators use verbal descriptions and hands-on materials to engage participants (check schedule for dates). Also, with at least two weeks' notice, you may request gallery educators who are trained as sighted guides to enhance the museum experience for blind or partially sighted visitors. Space Center Houston will waive the audio tour fee for visitors who are visually impaired; however, the audio tour is not specifically designed for visitors who are visually impaired. The Seattle Art Museum offers monthly audio description docent-led tours. They also have electronic Audio Guides for special exhibits. Other museums in the area which have occasionally offered audio description are Museum of Flight, Bellevue Art Museum, and Pacific Science Center. For more information, contact Vision Loss Connections at 206-282-3913. Leigh Yawkey Woodson Art Museum, Wausau, Wisconsin. Art Beyond Sight, for individuals with no or low vision, provides a multisensory exploration of the visual arts - offered quarterly during each exhibition. Since 2006, the Museum has included verbal descriptions, tactile artworks, raised-line drawings, sound effects, scents, and/or tastes in these free Art Beyond Sight programs that often feature interaction with artists in residence. Audio tours available, free, on iPod touch devices that offer artist interviews and audio interpretations of selected artworks from each changing exhibition and from the Museum's collection.